I appreciate the special wrapping it came in to protect the shinny exterior that makes it pretty BUT it should be re-marketed for home-office use. I thought some of the other reviews were exaggerating but it is true: the built-in handle groove collects bits of everything you're trying to toss no matter how careful you are so you end up either cleaning the lid several times a day or you have to take off the entire lid before tossing which is a hassle. I also bought at the same time, a Sterilite 13 gallon roll-top in black. My intention was to use the pretty, shinny Hefty one for regular kitchen trash and the Sterilite roll-top for recycle items. I'm back here today to order another Sterilite roll-top for regular kitchen trash to replace my Hefty Swing-lid. My 2-cents to Hefty: Either re-design the lid to be like Sterlitie's roll-top or re-market the Swing-lid for home-office paper trash. Home territory searches the web to find the best prices and availability on Trash Cans and related products foir your home like Hefty Swing-Lid 13.5-Gallon Trash Can, Multiple Colors. For this page, related items include products we find that match the following keywords: "Trash Can|Garbage Can|Trash Bin" at our vendor partner Walmart - Click More Info / Buy Now to check for price rollbacks!. 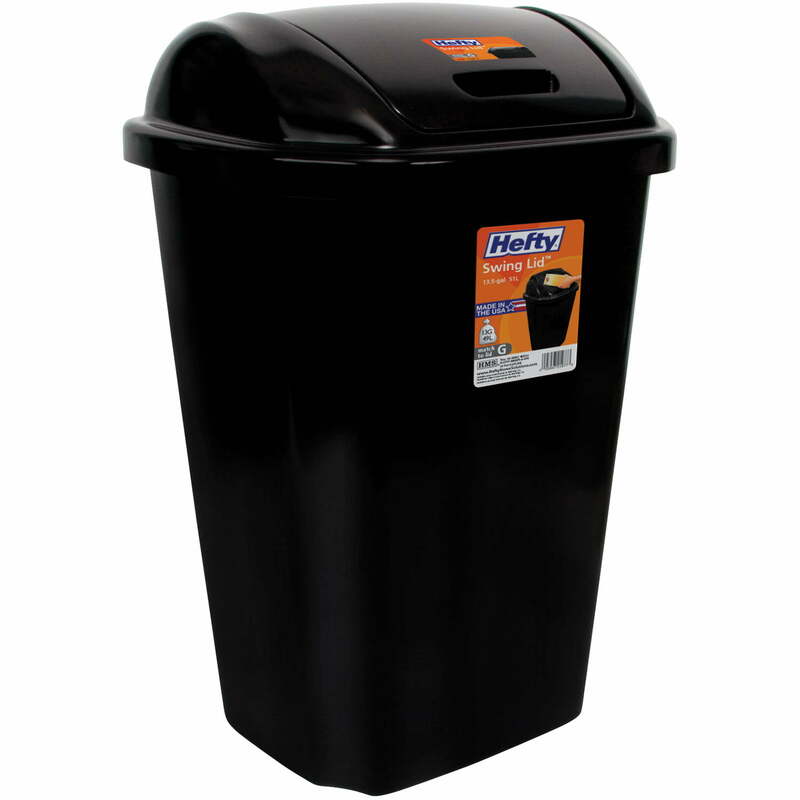 Hefty Swing-Lid 13.5-Gallon Trash Can, Multiple Colors is one of 49 Trash Cans and related products available for sale through HomeTerritory.com, If you have any questions on this product, please give us a call at 734-971-1210 during the hours of 9am - 5pm EST for assistance. Thank you for shopping at Home Territory, the home furnishings superstore!